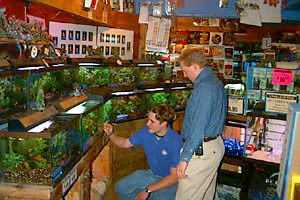 A World of Fish established in 1974 has a national reputation as a leader in the tropical fish industry....by manufacturers and hobbyists alike. Our retail showroom located in Minneapolis, Minnesota displays one of the most extensive freshwater and saltwater tropical fish selections in the Upper Midwest. Included are numerous rare and exotic species. 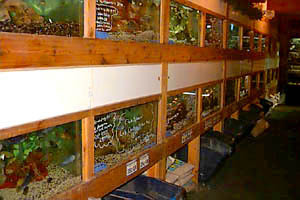 Check out our vast selection of African Cichlids from both Lake Malawi and Lake Tanganyika. In addition there are numerous oddball varieties of fish including many hard to find Corydoras Catfish and rare Plecostomus species, a selection of Discus fish raised and cared for by professional breeders, and a complete showroom of saltwater fish and saltwater invertebrates. 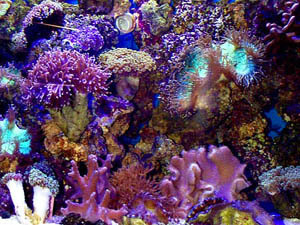 Check out the rare and exotic species in our spectacular 400 gallon saltwater display aquarium!